We have picked “Glacier and gardens” bundle and I think it did the trick – especially that Juneau was our first port of call. We have booked shore excursion with NCL in advance. There are some pros and cons in it. On the good side, it gives you certain peace of mind and convenience of on-line booking from NCL website. Tour buses are dedicated for your ship only – they are waiting next to the pier and know exactly how many people have booked, do if you happened to be late to get off the ship, they will wait for you. On the opposite side, price is on the higher side: Glacier Gardens excursion is $20-$25, and visitor center at Mendenhall Glacier is $3, so we have paid about $40/person extra for bus transportation and the peace of mind. Buses are waiting for people running late, so if you happened to be among the first to leave the ship, you may have to wait in the bus for a little while. Glacier gardens are just a short drive from the pier (well, everything in Juneau is just a short drive). Nevertheless, bus took us through all of the “downtown” Juneau, and the drive was long enough to feed us with all possible information about Juneau. Glacier Gardens tour is about 1 - 1.5 hrs and if I have to pick one word to characterize it it is “unusual”. There is a story about creation of the gardens that I leave aside – in case you are going to take a trip on your own, I do not want to ruin your chance to hear it first hand – but the fact that such a beautiful garden was never planned to exist, is unusual. 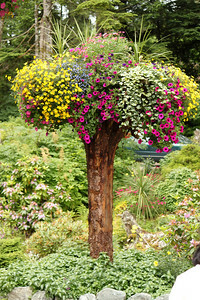 Upside-down trees with beautiful annuals blooming on their roots are one of a kind – I do not think I have ever seen anything like this – even at the pictures. Explosion of colors for such a northern location was amazing – I still do not understand how gardeners manage to get such flower festival given short, cold and rainy summer. 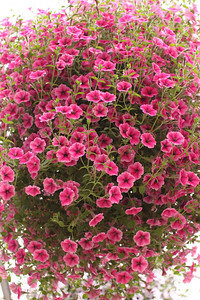 I haven't seen that colorful petunias in much warmer climates like Seattle or Boston. Overall landscaping of gardens is very nice – even though they are much smaller than you may guess from advertisement. Booklet says gardens are about 50 acres – which probably refers to the total area of the property, while landscaped part is more along the line of 5 acres. 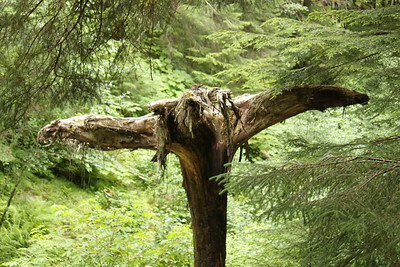 Still, few acres of beautifully landscaped gardens with wooden sculptures, waterfalls, rock gardens and unique upside-down trees is quite unique sightseeing. Site also includes a greenhouse/gift shop/snack bar, that displays very colorful fuchsias and petunias in various arrangements. If you are gardening enthusiast or just like flowers, you will be impressed like we were - please take a look at more pictures from Glacier Gardens. I also shot a short video clip in the gardens - link is on your left. After short narration about story of gardens (which is not that long , BTW – gardens were established in mid-80s) we were placed on the “shuttles” - some sort of gas-powered golf carts – and driven to the top of 580 ft hill. (Tour guides insist on filling up each vehicle, so if there are few large groups at the boarding station, there may be some hiccups). Dirty road going up is narrow, steep and partially supported by wooden structures, so it is not quite typical dirty road as well. 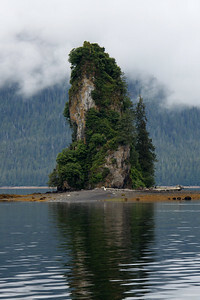 Views around it might be typical for the area and can be seen anywhere around for free – but for us who were first time at these latitudes in America, and probably not getting there again for a while, Alaskan Rain forest is quite an experience – it's just a wilderness of plants growing on nothing and fighting each other for a glimpse of a sunlight. At the top of the hill there is a system of wooden decks/ramps, arranging something like an observation deck. 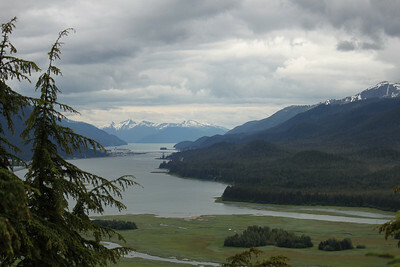 You can see Juneau international airport from the top, Chilkat mountains and Mendenhall valley. In theory, we should be able to see all the cruise ships docked in Juneau – but weather may impose some corrections on this, so we couldn't. Again, it is not most amazing view – bit quite unusual – have you ever seen a plane taking off, looking at it from the top? On the way down, which takes much less power from the car engine leaving possibility for the conversation, tour guide gave us some overview of rain forest ecology. We were told that there are no crocodiles and jaguars in Alaskan rain forest, and not even shakes – the only compelling danger is mosquitoes. After 90 minutes at the garden, we have boarded the bus and have had another short (about 15 minutes) drive to the Mendenhall Glacier. We have read an ad that this is “the only glacier accessible by a car”. It is true to a certain degree – you can get to a point where you can see the glacier and from which you can hike to the glacier – but it's about 1.5 mile from the visitor center and the end of the road to the glacier itself. and explore visitor center, but definitely not enough time to hike to the glacier, even if we were up to. Views of the glacier are pretty good, though. You can also see multiple icebergs floating in the beautiful, glacier-formed Mendenhall lake. We were surprised by the milky-green (!) color of the water, created by huge amount of silt dispensed by the glacier. We were also surprised how dirty is the glacier itself – it is nothing like crystal-white show-covered mountains, glacier carries with it a lot of dirt and silt from the ground it displaces, so it has layers of blue ice interleaved with earthy-dark membranes. Since we could not reach the ice, visitor center provided everyone a chance to touch it at least – they pull out smaller icebergs from the lake and place them on display for everyone to touch. We could also see other options of exploring the glacier “from aside” - there were people hiking to and from glacier, people kayaking to the glacier and people helicoptering to the glacier – and it makes plenty of people, needless to say. We were told about possibility to see a wildlife and “don't feed the bear” rules. Well, the only wildlife that can be seen from the visitor center are sea gulls – about 1:1 ratio to the number of people visiting. There are some stuffed wolfs and bears displayed in the visitor center, though. Visitor center also has three telescopes to see closer views of the glacier – much closer than 250 mm lens I have on my camera, so do not miss that. And probably more impressive than glacier and birds is an energy of flowers and trees – there is no crack or cavity in the rock that is not occupied by a flower, moss or a tree. On the way back, driver had given us a choice to get off in the middle of the downtown Juneau or to be taken directly to the pier. Downtown offers few more attractions, including “tram” - cable-way to the top of the 2000 ft Mt. Roberts. It's about a 1 -1.5 mile between downtown and the pier where NCL sips dock (others are even closer) and there are free shuttle buses running between downtown and piers, so you have a nice option to extend your shore excursion if you wish. If you managed to read to this point and still like it, you can find more pictures of Mendenhall Glacier here and a short video clip of Mendenhall Glacier on your left. Cruising on board of modern ships is already quite exciting. 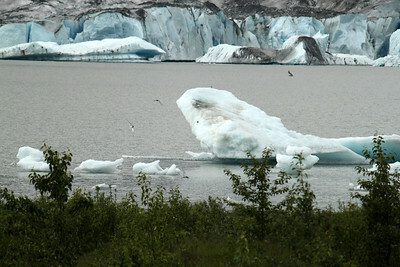 Visiting Alaska is one of most unique sightseeing one can imagine. Combine both, and you get truly once in a lifetime experience! 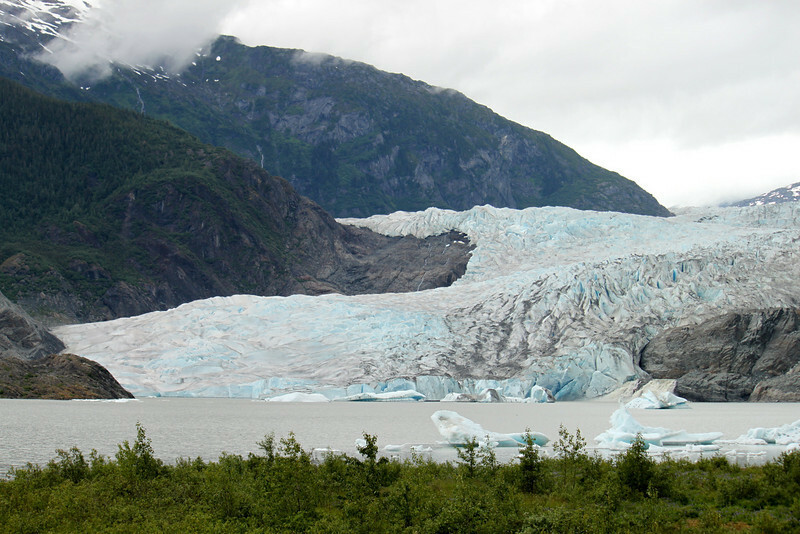 Our Seattle round-trip cruise included Juneau, Ketchikan, Skagaway, Glacier Bay and Victoria. We were lucky enough to catch sunny noon at the Glacier Bay, and have had wonderful time cruising Frederic sound on the way to Juneau. To keep long story short, we were extremely satisfied with the trip, and I can happily recommend it to everyone. And if you want to know more about the cruise, you can take a look at detailed review. We decided to book our Alaska cruise with NCL for very simple reason: we cruised on Norwegian Spirit in 2005 and were pretty satisfied - so you can call us loyal NCL customers. With the party of 5 we could not fit one cabin, and NCL site does not allow you to book two at once, so my wife decided to call. Overall, dealing with NCL over the phone was quite pleasant - live person picks up the phone quick, and is able to address your questions and issues quickly. However, net win was marginal, because they had to make two separate reservations anyway. It is not a big deal, however created us some hiccups trying to book shore excursions from two accounts at the same time. Either way, booking of the cruise and shore excursions as well as on-line check-in on the NCL web-site were overall quite pleasant and convenient. Cruise was rountrip Seattle, so to get there from Boston we had to fly, which I generally hate - especially speaking of 5 hr long flight. Jet Blue made it as nice as possible - simple on-line booking and check-in, no lines to drop-off luggage, leather seats with reasonable leg room... The only thing one needs to keep in mind is the fact that they cut costs by all possible means - so, they charge you for meals and even for headphones (bring your own, any standard headphones will do). Seattle - capital of Washington state (I can never understand why Washington City and Washington state have to be 4ooo miles apart - sorry, could not resist :) ). Given that travel from Boston to Seattle is about 9 hours "door to door" we decided not to challenge the fortune and stay overnight in Seattle both before and after the cruise. So we have had two full days there - plenty of time to admire the Emerald city. We used an opportunity to visit most popular tourist attractions: Seattle duck ride, Space Needle, monorail, Seattle Aquarium and Underground Seattle tour - detailed report of our experience in Seattle can be found on a separate page. Our overnight stay in Crowne Plaza hotel was also pretty nice - rooms are clean, personnel is knowledgeable and friendly, there is a bar and a restaurant on the second floor and value for the money was more than reasonable - I suspect we paid way below the street price because we have booked via NCL. Transfer from the hotel to the pier was a little disorganized. First, cruise line (or lines?) place 100+ people in the hotel, so lobby in the morning was pretty packed with people waiting for shuttle buses and it was not quite clear which bus is for whom etc. Secondly, it is normally 15 min walk from Crown Plaza to the piers, but there happened to be a street parade on 4th avenue, totally blocking the traffic. It took us about an hour to get to the pier, and even though bus driver tried to entertain the crowd with improvised city tour, sitting in a traffic jam is not most pleasant part of the trip. Boarding the ship was another long wait. Even with on-line check-ins and plenty of people preparing travel documents at the pier, having 2000 people to go through security checkpoint, photographed, key card printed etc. takes a lot of time. While I do not blame anyone and can call boarding well arranged, it is still just a boring waiting time - we spent somewhat another hour there to get on board. Norwegian Pearl - if you have never been on a cruise ship, it is something that is hard to explain in plain words. "Floating town" is probably most accurate analogy, and all big cruise ship are somewhat similar in that respect. Picture on the left is our ship, but it is taken in Ketchikan, not in Seattle - please do not get confused by the shore view. But it gives some feeling of the size of the ship. I also have gallery of pictures taken right after departure from Seattle on a separate page. One thing that cruise companies do not want you to pay attention to, is the weather. The ship is great, food is great, entrainment program is amazing - but you went to Alaska Cruise and you are expecting extraordinary scenery, right? Well, Alaska has about one sunny day per week, so your ability to do sightseeing is quite limited. 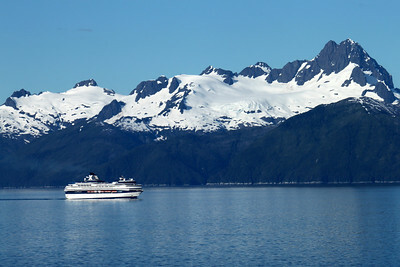 First day of sailing was announced in the itinerary as "cruising the Inside Passage". In reality, we were within sight of land for 3 hours during the day. Plus, weather was foggy to say the least - you can judge for yourself from the photo on the right, and if you like to see more, I have whole gallery of "cruising the Inside Passage" day. Given not-much-to-see conditions, we spent the day making ourselves familiar with the ship. which I consider time well spent. On the same day we also had a dinner at teppanyaki on board of Norwegian Pearl, and we find this traditional Japanese restaurant one of the best of its kind. Norwegian Pearl has arrived Juneau at 2 pm sharp (if you can apply "sharp" to the docking procedure that takes more than half an hour). Before that, we have had one of the most beautiful mornings of the whole cruise - starting about sunrise, ship was traveling the Alaska inside passage for real. Norwegian Perl was traveling between Baranoof, Kuprianoff and Admiralty Islands, slowly unwinding beautiful views of snow-covered mountains and sapphire-blue straits while approaching capital of Alaska. Juneau itself is nice tiny city, slightly disfigured by one and only 15-story federal building in the state. Nevertheless, we left the ship, boarder a bus and went all the way to Glacier Gardens Rainforest and Mendenhall Glacier adventure - our first shore excursion of the cruise. On the scale of any mainland state, Skagway (or Skagaway - you can see both spellings) is one of the tiniest towns possible - about 800 permanent residents. Emerged from fishing village during gold rush at the end of 19th century, town now leaves on selling memorabilia of gold rush to the tourist - successful enough to triple its population during the tourist season. Seriously, there is nothing in the town but few restaurants, gift shops and famous tourist attractions. 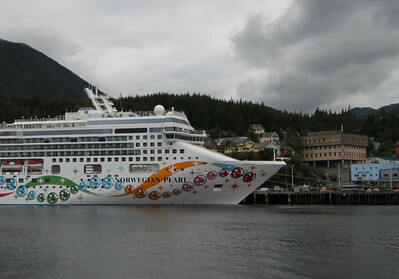 Norwegian Pearl was docked in Skagaway for the whole day - 6am to 8pm, leaving plenty of time to take shore excursion and explore the town. 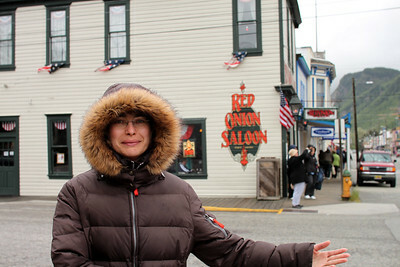 Photo on the right depicts very famous for 100+ years "Red onion saloon" - and there are much more photos of Skagaway on this site. Glacier bay is probably most beautiful part of the whole cruise, and we were very lucky to have beautiful sunny weather there. Norwegian Pearl has entered Glacier Bay national park early in the morning, and spent most of the day cruising narrow inlets left out by retracting glaciers. Combination of emerald water, blue sky, white clouds, sparkling ice and rocky mountains is a must see of the cruise - you will see for yourself at glacier bay photo gallery. Ketchikan - salmon capital of the universe and yet another rainy day of the Norwegian Pearl Alaskan cruise. While much bigger than Skagway, Ketchikan is still mostly tourist-oriented town: whole "downtown" of Ketchikan is an amazingly beautiful collection of gift ans jewelry shops, sparingly interleaved with bars and restaurants. If you have few thousands to spare, you may find downtown Ketchikan a nice place to spent your money - I can't say that I like it a lot - may be I do not have enough to spare :). After the excursion we took a stroll through downtown and have found beautiful samples of sculptures made by native Alaskans out of Mammoth bones, neighbored by huge offering of rare ammolites. There is also very good selection of fur coats and jackets - all in all, it is cold there in Alaska! Victoria - the capital of British Columbia, Canada. 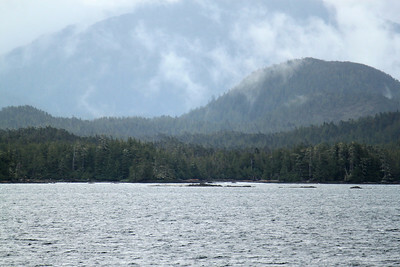 After leaving Ketchikan the day before, ship spent most of the day sailing, with arrival to Victoria scheduled for 6pm. So, we were limited to about 4 hours in this beautiful old city, which is unfortunate - I'd say, it deserves more. 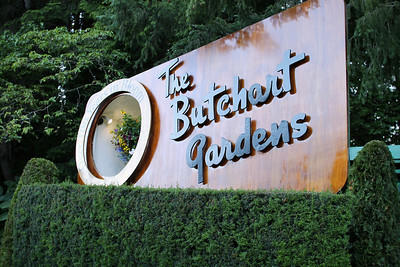 Despite much less exotic climate, city exhibits very charming old architecture and nice landscaping throughout - not to mention beautiful Butchart gardens where we spent most of our time ashore (see photos). Since this is the last slide of the story, there should be some sort of the line drawn here. So, here is the bottom line: Alaska Cruise worth every penny invested in it - it is most amazing vacation week one can imagine. Go for it if you are in doubt!